ESIC (Employee's state insurance corporation) is conducted by the Ministry of labour and employment, the government of India. 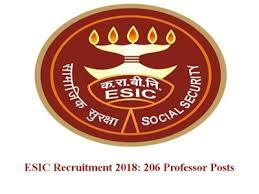 ESIC is self- financing social security and health insurance scheme for Indian workers. The candidates can follow the following procedure to see the ESIC Cut off marks. You can download and take a printout of the ESIC result PDF for further reference. The candidates can check the ESIC exam cut off marks 2018 in this section. The candidates can check on the section in the table given below to see the desired cut off of online examination and Computer skilled test based on the categories. The table below shows 2018 cut off score of online examination for different categories. The table shows 2018 Cut off marks of computer skilled test (The working knowledge of PWD candidates who are unable to type due to their disability) of different categories.